In December, I signed up for the Comenity Bank issued Virgin America Visa card. Like many people, I have been scratching my head as to why Virgin America partnered with Comenity. The website is not too good, I have tried entering my password and 9 out of 10 times it fails to allow me to log in and I have to reset the entire account. Reaching someone of the phone takes a long time, and trying to coordinate a billing date is impossible as they group everyone in a region. You could read more about the nuances of Comenity and Virgin America on Flyertalk. After learning from Freequent Flyer about small credit card balances, I was surprised to see Comenity forgave my balance of $.95. 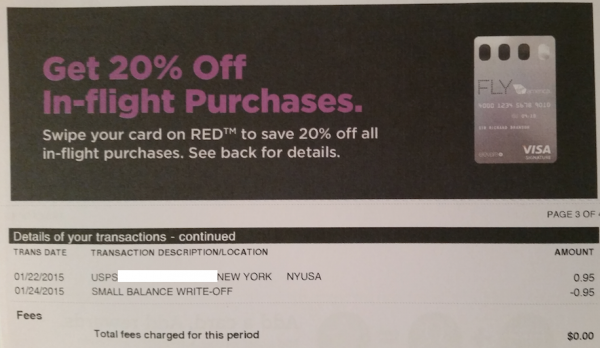 I had a balance of over $2000 and paid that off thinking I wouldn’t use the Virgin America card for a while. When I went to the post office a few weeks ago to mail out the latest batch of gift cards, I needed to purchase some postage, 2 $.23 stamps and 1 regular Forever stamp and charged it on the card. Before I even had a chance to pay for it, Comenity wrote off the balance and paid for my postage. The write off was after the statement closed, I assume?